Today we get to chat with Tristan und Isolde's villain, Melot (boo! hiss! 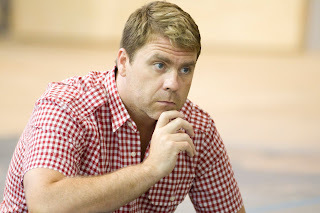 ), sung by tenor Jason Collins. Jason first sang on our stage as a contestant in our first International Wagner Competition, in 2006, and has returned for the Steersman in Flying Dutchman (2007), the second IWC (2008), and Froh in the Ring (2009). Welcome back to Seattle! You’ve been here now five summers in a row. It must be getting to feel a bit like home...or at least summer camp. It is more like my "Opera Home". I try and stay in the same area each time and just love Seattle summers and Seattle Opera. My favorite place to work is right here! I am never disappointed. Not to mention, I usually get to work with a lot of the same friends. As the Wagner world is quite small. 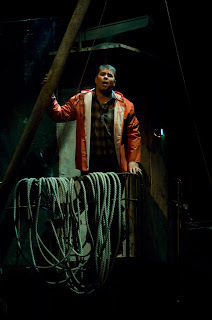 Jason Collins as the Steersman in Seattle Opera's 2007 Flying Dutchman. You play the bad guy in Tristan und Isolde, Melot. But nothing is black-and-white in Wagner, and maybe Melot has a valid point of view. Does he cause the tragedy of this opera? Certainly nothing is black and white in this production. I like very much what Peter has done. For this particular production, I think Melot is offering Tristan a solution. When he encounters him, he's certainly under a spell he can not escape from. Clifton, Peter and I have had a few nice conversations about this "angle". I think its much more interesting than just "Bad Guy". 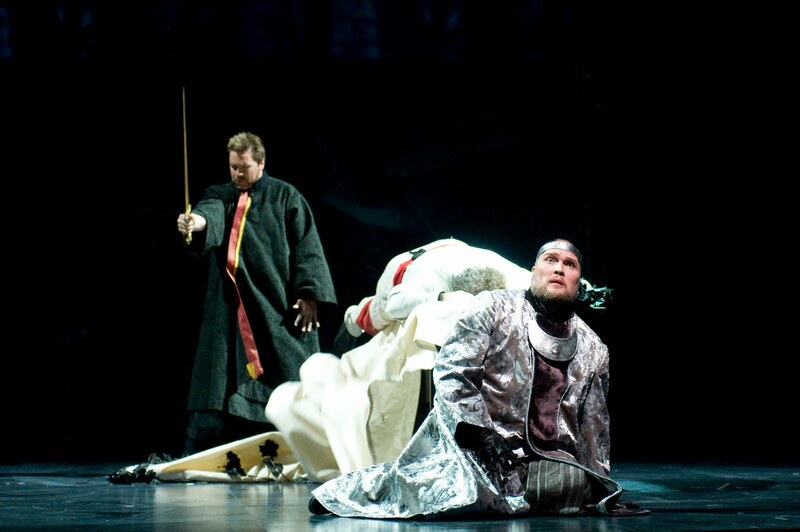 Jason Collins as Melot looks in horror at the sword upon which Tristan (lying on table) has impaled himself, while Stephen Milling as King Marke tries to comprehend the tragedy that ends Act Two. You have a very brief role in Tristan, but when you’re onstage it must be enormously intense. How do you pace yourself, and/or focus, to play this part? In a way, I find it more difficult. There is no time to warm up to the character on stage. So it all has to be done in the dressing room. With only a few lines it takes a great deal of focus and being part of the action that is going on around you. Other wise, you just become "that guy". What’s it like working with a stage director, Peter Kazaras, who has also been a Wagner tenor? I have known Peter for years and it is MOST REWARDING to collaborate with him. Simply put, he gets it. He knows what it is like to get this kind of project on its feet from ALL angles. He is a BLESSING! 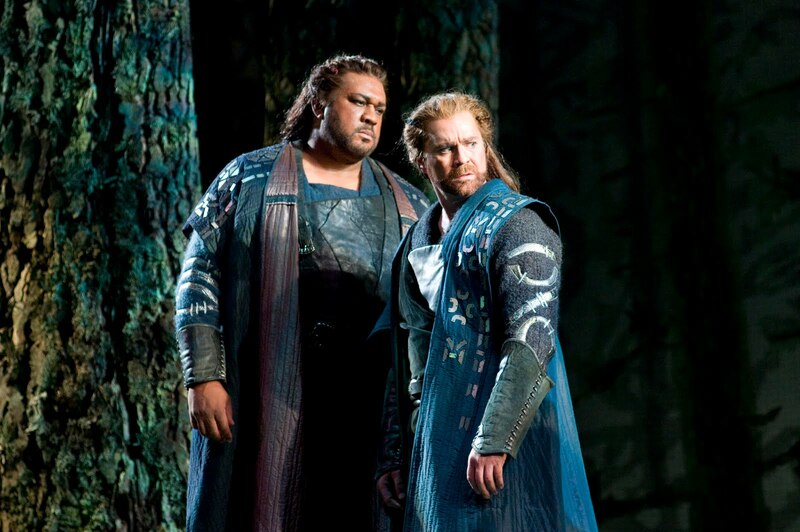 In last summer's Ring, Jason Collins sang Froh, with Gordon Hawkins as his brother Donner. Where are you these days when you aren’t in Seattle? And what are you singing when you aren’t singing Wagner? This past year has been wonderful, as will the next. I have been singing a lot of Mozart (Idomeneo) in Bologna and the regions around that. Kat'a Kabanova with Lyric Opera of Chicago, The Messiah at the Kennedy Center. Next season is full of a lot of new work including my first Parsifal and Medea. But it is WONDERFUL to be back home here in Seattle.